Ilayathalapathy Vijay's Puli is doing rocking pre-release business and the team is super happy as they have just completed 50 % of the movie. Recently,Sri Thenandal Films have snapped Puli North South Arcot area rights. 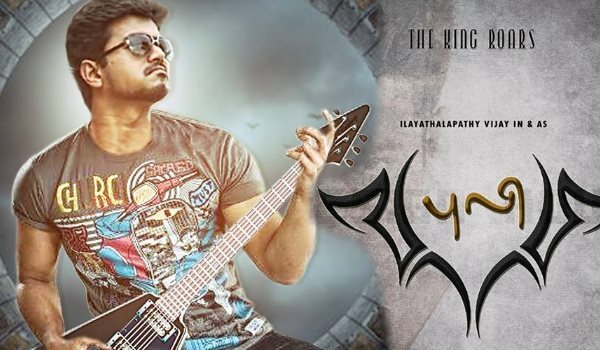 We also hear that Ayngaran International is already in talks to get the Europe theatrical rights of Puli and they will be soon signing the deal. Now the hot update is that famous director/producer S Narayan has snapped the film's Karnataka theatrical rights for a whooping amount. S Narayan is a popular Kannada director, who has procured the Karnataka rights for a fancy price. Even though the amount paid for the rights has not been revealed, traders say it is a record amount for a Vijay movie. S Narayan only Tamil movie under his banner is Prashanth starrer "Jai". The filmmaker reportedly considered Sudeep's presence in the film as a huge factor and paid the huge amount for the theatrical rights of "Puli". As Kiccha is a big star in Karnataka, the combination of Vijay and him could be the biggest crowd-pulling factor in the state. Hence, S Narayan did not hesitate in quoting a fancy price for the distribution rights. It is also being speculated that Sudeep, who is close to S Narayan, helped both the parties in sealing the deal. The Tamil movie is likely to hit the screens in July 2015. As Thameens is one of the producers of Puli, they will be releasing it under their own banner in Kerala. Directed by Chimbu Devan, Puli is touted to be a fantasy action entertainer with stellar star cast including Sridevi, Shruthi Haasan, Sudheep and Hansika. Q. Why all the ATOMIC ENERGY PRODUCING SITES ARE IN SOUTH INDIA (Tamil Nadu), wake up southerners (if there is a "radiation leak" it will wipe out people in Keral, Tami Nadu, and some part of Karnataka & AndraPradhesh and also Sri Lanka). Instead of fighting amoung you all, watch out what's going on or look after your own states (very important). LEAK IN RADIATION MEANS "WHOLE OR PART OF THE STATE COULD BE WIPED OUT.